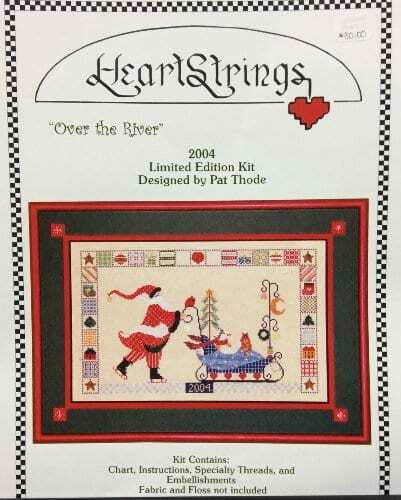 Designed by Pat Thode of Heartstrings this is a limited edition semi-kit for the holidays. A skating Santa is pushing his sleigh with a primitive tree, snowman and cat riding. A checkered border of Christmas themed items alternating with plaids surround the top and sides. Originally released in 2004 these are just being added to the catalog. Kit contains counted cross stitch chart, specialty thread and embellishments. You add fabric and floss. Design size is 211W x 127H or 15″ x 9″ on 28 count or 13 1/4″ x 8″ on 32 count. Just the thing for holiday decor!